One important objective of the Canal Plan is to create more open space for everyone and treat the Canal as a linking element rather than a barrier. This is the future of Béco Dock: it will become a place of recreation for many people in Brussels. The left bank (Quai des Matériaux) has been earmarked for development as Béco Park, from where you will be able to walk to Tour & Taxis Park. On the right bank, the Citroën Building will become home to the Museum of Contemporary Art, linking the historic city centre with the Canal Area. The nearby Quai des Péniches will continue to be used for events. Picard Bridge, construction work on which starts in 2017, will provide a direct link between Brussels North and Tour & Taxis, but also between the two banks. UP-site already opened in 2014 and offers more than 250 homes, and other housing projects will follow on this bank of the Canal. The SAU-MSI has a multifaceted role for Béco Dock within the context of the special Canal Team. For example, it is acting as the commissioning authority for the new Museum of Contemporary Art. It is currently working on a programming study, and other construction projects may be commissioned. Another important role is the SAU-MSI’s coordination work between the various (public and private) projects. Concrete examples include the projects for Béco Park, Picard Bridge and Avenue du Port which are under development. The coordination of the various projects means that the park, the bridge and the housing project on the right bank will fit together in a more integrated manner. The materials used in the projects will also be harmonised in order to guarantee the necessary continuity. For the renovation of Avenue du Port, the SAU-MSI, along with Brussels Mobility, has brought the various public partners (such as the utilities) and private partners around the table in order to shape the project in detail and take the right decisions before submitting a planning application. A more overarching role is the identification of the different projects and the coordination of their implementation in order to ensure the neighbourhood’s accessibility. This includes specific communications for each project, in which the SAU-MSI draws attention to the links with the Canal Plan. Vergote Dock is the place where many port-related activities take place in the city centre. 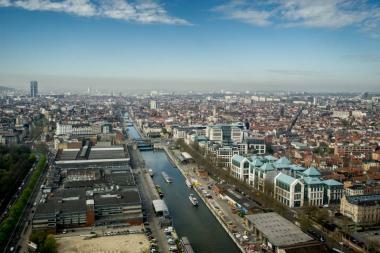 The Canal Plan aims to maintain this activity and integrate it in the city sustainably. The Construction Village (due for completion in mid-2017) is a good example of this, grouping together different building materials companies and stimulating water transport. Other companies in the dock are working with the government to minimise the nuisance caused by their operations and further integrate them into the urban context. Vergote Dock will be partially opened to the public by means of ‘public balconies’, such as the park at the turning basin or the Monument to Labour. The role in this area of the SAU-MSI, as part of the special Canal Team, mainly focuses on ensuring close cooperation between the companies in the dock, the port authority and the regional government, as they work to improve the integration of industry in the urban context. This involves reducing noise and dust, but also ensuring more efficient land use in order to optimise activities and make way for new possibilities. The SAU-MSI is also acting as a commissioning authority for the redevelopment of the port park, so that this can open up for the neighbourhood in the short term. This part of the Canal skirts various districts with greatly differing characteristics (Dansaert, Chaussée de Gand, Heyvaert, Birmingham, etc.) as well as several sites that constitute urban landmarks, including Petit-Château, Porte de Ninove and the Anderlecht Abattoirs. Some of these will undergo significant changes in the years ahead. The Heyvaert district, with the gradual relocation of used vehicles export activity to the outer harbour, will experience unprecedented change; one of the objectives will be to convert industrial buildings to accommodate new economic activities compatible with the urban environment. Porte de Ninove will benefit from clear improvements to its public spaces and the creation of a new regional park around which mixed-character projects of high architectural quality will emerge. The Anderlecht Abattoirs have started to reorganise the occupation of their historic site; the aim is to gradually redeploy their activities by 2030 in order to redevelop as a new Regional food hub. The Birmingham district will, among other initiatives, host a new industrial activity that is compatible with the urban environment. VIVAQUA has decided to set up its new plant there which will produce the synthetic materials needed to overhaul the Brussels drainage system. This project will be combined with the development of housing and office space, as well as improvements to public spaces. Here too, the SAU-MSI, as part of the dedicated Canal team, is coordinating companies and the Regional authorities to promote the best possible integration of industry into the urban fabric and the optimal use of the available space.